The Japanese aesthetic is wonderfully quirky and one of the most unique point of views in the world. Just take for example this really funky watch. The Pimp Pusher watch from Tokyo Flash is a wonderful fashion accessory that is not only useful it’s also a great conversation piece. The watch has 72 surface mounted LEDS. These LEDs tell time by lighting up one light for the hour, which is located in the left column. It then also turns on one light for every minute that passes. So for, example, it 3:15, 18 LEDs will be turned on on the watch face. 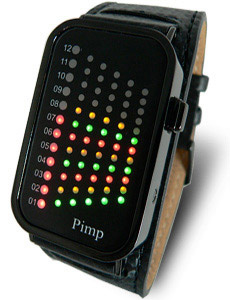 But where does the “Pimp” come in with this Pimp Pusher watch. Well, between 6 PM and 1 Am, which is considered Pimp Time (go figure), rows of the LED will light up at random in order to catch the attention of people around you. Maybe the light display is a technological equivalent of showing your mating feathers or howling like a banshee like howler monkey in heat. Be warned though, the watch may look very cool, but telling time will require constantly exercising your math skills. All for the name of fashion, eh?